This weekend, I had a bit of a treat: it was my yearly trip to the Metropolitan Opera with Fiancé’s family friend. It’s always something I look forward to, since we started doing it a couple years back, because it’s both a fun thing for someone with theater and voice training to experience, as well as a glimpse into a kind of old-fashioned lifestyle that I wouldn’t otherwise get to see. Our weekend always starts with a drive up to Fiancé’s parents’ house the night before. They live at approximately the halfway point between our house and New York City, so it makes sense to drive up that evening, sleep there, and drive to New York City in the morning, where the closer proximity makes it an easier day trip. The next morning, we leave bright and early, stopping for Starbucks at our usual stop, and then arriving in the city just before noon. This time, we ate at the Opera house restaurant, which is an exercise in luxury and service. The gentleman who served us seemed like an old pro, like those old steak houses where the waiters seem like they’ve been serving ladies and gentlemen steaks as a career for the last 40 years. It was early in the day, so we had a choice of lunch or brunch. Fiancé’s friend and her friend chose lunch; we chose brunch. Fiancé chose one of the most decadent French toasts I’ve ever had. And of course, prosecco to accompany. 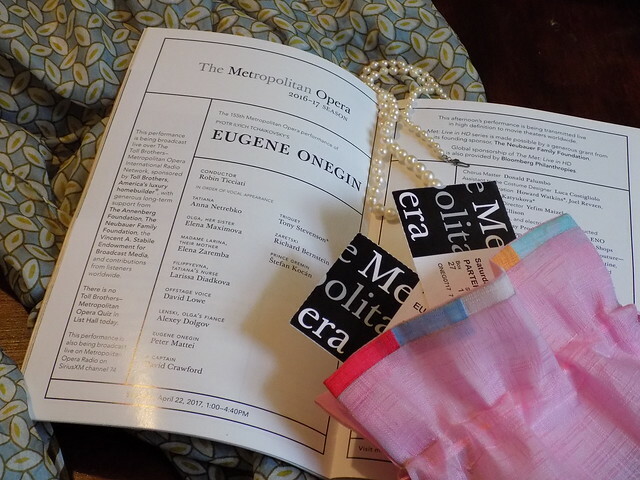 From there, we went to the box, where we watched the first act of Eugene Onegin, an opera that is unmistakably Tchaikovsky from its opening notes. It’s an interesting opera because the first of the three acts feels interminably long. It takes over an hour for our young heroine Tatiana to fall in love at first sight with her neighbor’s handsome friend, Onegin, for her to confess her love in a cringeworthy teenage love letter, and be (gently) rebuffed by him. Even the opera veterans with us complained a bit that they were ready for a break. At intermission, we returned to the Opera House restaurant to find a pot of coffee waiting for us at our table for Fiancé. Upon our arrival, fresh chocolate soufflés were brought out, along with a little pitcher of crème Anglaise. They were delicious, though lighter in chocolate flavor than my absolute favorite chocolate soufflé. But a delightful interlude. The intermission lasted longer than it took to have soufflé and coffee, so Fiancé and I walked around and looked at the costumes on display on the Parterre level. Act II picked up the pace considerably. A grand country house’s ball opened the scene, and I recognized a fair amount of music from barre exercises in my old ballet classes, which was fun. There was even a little section sung in French, which was a welcome contrast to Russian. And then, to end the act, a duel and what is probably the absolute swiftest operatic death scene I’ve ever seen. The second scene of the second act is where the story starts taking a darker turn, with two friends dueling over a woman with whom the title character only flirts with out of his own misplaced sense of annoyance. And the scenery reflected that so beautifully. They used mirrors to give a sense that the barren wasteland of the set went on forever. It reminded me of something out of a Dali painting. Act III was similarly paced, again opening with a ball scene. This act reinforced something that I had noticed from the beginning: the use of offstage singing to give a sense that the onstage character was somehow set apart from the rest of the world. In the first act, the women open the show onstage while villagers sing offstage, giving a quaint feeling of a stolen glance at private life. In the third act, Onegin sits in the periphery of a dazzling party. But they used the same wasteland set, with only the addition of columns to suggest the architecture of St. Petersburg. As Onegin sits miserably on the sidelines, he sees a vision of his past: Tatiana, the girl he spurned. Only now, she has blossomed into a self-confident woman, and of course he falls madly in love with her. And she is not unaffected by him. But the highlight of the first scene is the beautiful basso aria sung by her husband, the Prince Gremin, about how much he loves her. I got a sense of a woman, spurned by her first love, meeting a man who showers her with all the affection she had hoped for from the other. But upon seeing Onegin again, she remembers what it is to feel that love herself. In the final scene, the two of them meet and Onegin declares his love, begging her to run away with him. This is where the opera dazzled. Instead of spurning him right away, or falling desperately into his arms and a happy ending, Tatiana first rounds on him and asks him why now. Why is she good enough for his love now? It’s a brilliant sight, watching this grown woman throw a petulant and immature man’s declaration in his face. He himself had admitted only a scene earlier that he hasn’t made anything of himself, and yet she has gone from a clueless country girl to a princess. Then, she turns to him and tells him that she loves him, too. He looks up, and you can see the hope and joy in him that his love loves him. He is going to get what he wants. But, no. This is opera, after all, and a Russian one at that. Tatiana continues to say that although she still loves him, she is not going to forswear her marital oaths. She then tells him farewell forever (echoed from the second act when her sister’s ill-fated lover leaves her to duel his friend). And in a beautiful parallel, made all the more poignant by the complete silence of the orchestra, she walks to him, pulls him into a passionate kiss, as he had done in the first act when he spurned her. And then she turns and walks away, her heels echoing through the entire opera house. And that’s it. Onegin falls to the ground, realizing what he’s lost and the curtain crashes down. It’s beautiful in its severity. It almost took a moment to bring myself out of this lovely experience, but of course we had to drive back halfway home. But that is an opera I will keep with me for a while. Anyone who has the opportunity to see it should jump at it.